Ever wanted to put all those little paint swatches to good use? Her are three easy paint swatch arts and crafts projects for you to try! 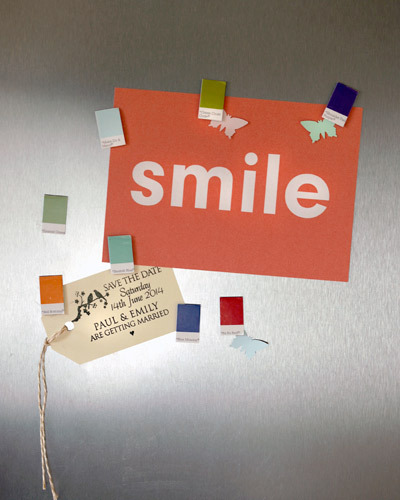 Decorate a vase, jazz up an index box, make some fun fridge magnets using your favourite paint swatch charts. Once you’ve completed these projects we’re sure you’ll want to decorate more! give your old vases a touch of 3D colour with a paper punch and a pretty colour spectrum. 1. Choose the colours you want your butterflies to be. We chose ours in dark to light shades and could cut out two butterflies from each colour swatch. 2. Punch out all the butterflies you need and line them up in the order you want to attach them to the vase. Fold each butterfly in half so that it will have a 3D flying effect once attached. 3. Decide on how you want the butterflies to be positioned. You could go for around the top of the vase or in vertical lines. We chose a swirl around the vase. Starting with the darkest blue butterflies at the bottom and working our way up and around the vase with lighter blues then on to pale greens at the top. 4. To stick the butterflies on use a tiny amount of glue (we used Copydex as it sticks quickly and dries clear) on one side of the wings. With the next one glue the opposite wing. Attach them at different angles so they don’t all line up. This will give the whole vase a more natural and interesting look. 5. Leave to dry completely. These have to be one of the easiest, yet most effective ways to add some colour to your fridge door. What’s more you can make them in under 5 minutes! 2. Remove the sticky backing from the magnetic strip and stick onto the paint swatch. 3. Display on your fridge. Never loose an address again once you’ve made these easy indexed cards. Colour co-ordinate each tab to make them stand out. 1. Use the base of a small glass as a template to draw a semi-circle onto paint swatches, then cut out. 2. Glue the bottom edge of the paint swatch and attach it to the back of an index card, at the top right side. 3. Continue to add paint swatch tabs to index cards, spacing each one along a little, until you have filled up a whole row. 4. Place blank index cards behind each tab.